Love the template, learning curve is still on going, great looking template. Manageable, and client loves it. Implementing such type of framework drastically accelerates the entire process of making web pages. Common styles are really simple to adjust, that offers a versatile and simple method for building web page templates. Responsive layouts adjust to little as well as large screen dimensions automatically. No matter what sort of gadget your clients might utilize to enter the web property - they will view a vibrant picture with a handy navigation menu. It is really an especially relevant function, considering that a lot of visitors now favor their cell phones for web surfing. Yes, you can redistribute Outdoors& Travel WordPress theme under the terms of the GPL as well. What am I allowed and not allowed to do with the WP templates for Sport Equipment ? 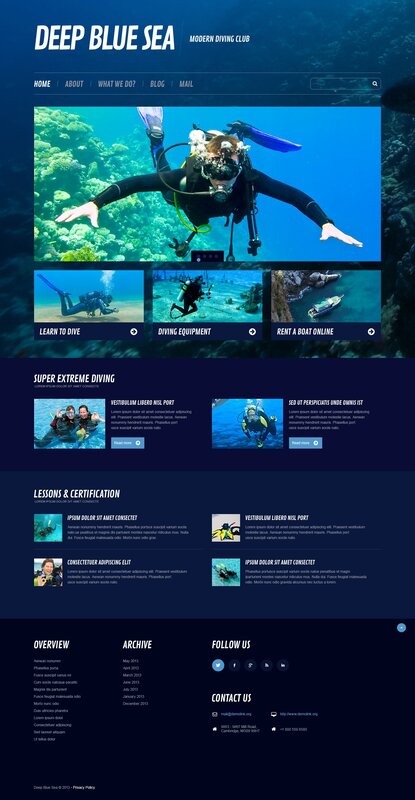 You may: Build a website using the WordPress design for Scuba Diving Courses in any way you like.You may not:Resell or redistribute templates (like we do).Claim intellectual or exclusive ownership to any of our products, modified or unmodified. All products are property of content providing companies and individuals.Make more than one project using the same template (you have to purchase the same template once more in order to make another project with the same design). Can I contact the Dive Center WordPress theme author? Yes. You can contact this Dive Center WordPress theme author/author's team directly using your personal account under the Support tab. Will TemplateMonster help me to install my Diving Lessons WordPress template? Some of our products like osCommerce templates, Zen Cart templates, etc. require installation to operate. Installation services are not included in the package price. TemplateMonster though offers you a variety of sources to help you with installation of your Diving Lessons WordPress template including installation instructions, some articles with our Online Help Center. Our Knowledgebase contains customers questions and most frequent problems. Anyway, you can always refer to our partners from TemplateTuning.com to install your Diving Lessons WordPress template for you for a small fee. What is the difference between unique and non-unique WordPress template for Scuba Diving Association purchase? Non-unique purchase:Non-exclusive purchase means that other people can buy the WordPress template for Scuba Diving Association you have chosen some time later.Unique purchase:Exclusive purchase guarantees that you are the last person to buy this template. After an exclusive purchase occurs the template is being permanently removed from the sales directory and will never be available to other customers again. Only you and people who bought the template before you will own it. Will the WP template for Outdoors & Travel be deleted from TemplateMonster database? No, the WP template for Outdoors & Travel will not be deleted from TemplateMonster database. Can I resell the customized Sports WP template? No, you cannot resell the customized Sports WP template as a template but you may sell it as a project to your client (see paragraph 1 ONE TIME USAGE LICENSE for more details). Do you provide any scripts with your WordPress designs for Scuba Diving Association or could you do some custom programming? Our templates do not include any additional scripts. Newsletter subscriptions, search fields, forums, image galleries (in HTML versions of Flash products) are inactive. Basic scripts can be easily added to a WordPress design for Scuba Diving Courses at www.TemplateTuning.com If you are not sure that the element you're interested in is active please contact our Support Chat for clarification. What are the advantages of purchasing a WordPress design for Diving Association? The major advantage of purchasing a WordPress design for Diving Association is price: You get a high quality design for just $20-$70. You don't have to hire a web designer or web design studio. Second advantage is time frame: It usually takes 5-15 days for a good designer to produce a web page of such quality. Is it possible to reactivate my download link for WordPress design for Scuba Diving Courses if it was deactivated after 3 days? Yes. Please re-activate the download link for WordPress design for Scuba Diving Courses within your account under the Downloads tab or contact our billing department directly regarding that. What do I receive when I order a Sport Kit WP template from TemplateMonster.com? After you complete the payment via our secure form you will receive the instructions for downloading the Sport Kit WP template. The source files in the download package can vary based on the type of the product you have purchased.If you need unzipping software to open the .zip archive, Windows users may visit www.WinZip.com, Mac users may visit www.StuffIt.com. Is there any return policy for Dive Center WP templates? Requests for a refund are accepted at www.template-help.com/tickets within the period of 2 weeks after the order of WP theme for Sport Newspaper is placed. You should accompany this request with detailed and grounded reasons why you apply for a refund. Please make sure your request does not contradict the terms and conditions specified in the policy. A refund is issued to you upon receipt of a Waiver of Copyright signed by you. Can I put low resolution thumbnails of WP themes for Diving Store on my website for my clients to choose designs? How can I modify WP theme for Scuba Diving Equipment to suit my particular website? Please visit our Online Help Center to obtain detailed instructions on editing WP theme for Scuba Diving Equipment. What is a one time usage license for a WP template for Outdoors & Travel? When you buy the WP template for Outdoors & Travel at usual price you automatically get the one time usage license. It enables you to use each individual product on a single website only, belonging to either you or your client. You have to purchase the same template again if you plan to use the same design in connection with another or other projects. When passing files to your client please delete the template files from your computer. Can I resell the WP themes for Extreme Sports I bought the extended license for? No, you cannot resell the WP themes for Extreme Sports as is. You can only sell them as the integral part of your new product. Are there any restrictions for using imagery, cliparts and fonts from the WP template for Sportsmen I purchased? All imagery, clipart and fonts used in WP template for Sportsmen are royalty-free, if not stated otherwise on the product page, and are the integral part of our products. One Time Usage License and Developers License give you the right to use images, clipart and fonts only as a part of the website you build using your template. You can use imagery, clipart and fonts to develop one project only. Any kind of separate usage or distribution is strictly prohibited. Is it possible that Template Monster will contact my client which website I made from Template Monster's website WordPress template for Diving Courses? Yes, our legal department checks licenses regularly. In case we won't find designer's contact information on the site which was made from the WordPress template for Diving Courses of ours we will contact the owner of the site directly. Are there any discounts if I'm buying over 10, 20, 30 or more Sport Teams WordPress design theme? Please email to marketing@templatemonster.com with your inquiries about Sport WordPress themes. How many applications, programs etc can I use to integrate with the Scuba Diver WordPress design themes under one extended license? The extended license gives you the right to use the purchased Scuba Diver WordPress design themes for the integration with one software/freeware/application/CMS/sitebuilder only. In case you would like to use the template with the other application, the other license is to be acquired. I was using this theme for a divin shool. With Cherry framework the theme was installed in a couple of minutes. I was able to use all of the icluded pictures so that i have not to order them too. With Cherry Framework i can edit things like Titles, colours, pictures etc. very fast. After a couple of hours i was able to send the final website to my customer and he can edit content very easy onself. The diving responsive WordPress theme is everything they say it will be. It&#039;s easy to edit and the responsiveness is right on. I am using this theme to help my favorite dive shop on Gili Trawangan to develop a new web present. The dive shop is IQ Divers Gili T and they are amazed at how easy the site is to work with. It&#039;s amazing that guys from this area of Indonesia can work with this WordPress site. It just goes to show you how easy and responsive the theme really is. Excelente diving theme, my costumer loved it. Easy to install en easy to costumize. Worth buying. Thank you for this wonderful template. This template is really easy to use. We love it! Great theme &amp; easy to use - my client loved it! Absolutely love this template! So easy to work with love it! Nice looking template, working 100%. Once again - NO complaints! I purchased a template and had a little trouble with the install. Technical support took some time to respond, but they did solve the issue. I would purchase another template from them.